What will the future of support look like? We are entering a time of rapid and fundamental change in the world of IT. With the disruptors of cloud computing, mobility and social business going mainstream, the fundamental relationship between IT and its customers is changing. How will this impact the Service Desk and what must support organizations and professionals be doing now to prepare for this future? 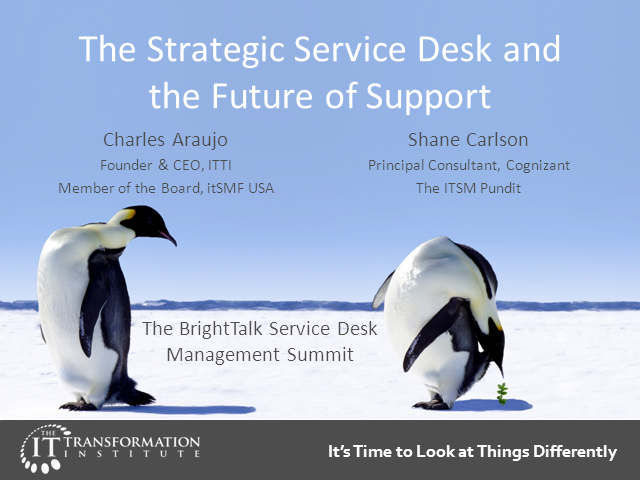 Based on an upcoming HDI article and a series of blog posts, Charles Araujo and Shane Carlson will explore this future examining how support will become social and why service desks will begin to look more like an Apple store. This interactive presentation will challenge current ideas of how support should be delivered and describe what it will take for Service Desks to become truly strategic and remain relevant in this coming era of IT.